Saturday 18th November - Run of the Month - ASCA Cross Country Dublin. Inclusions, with photos, please to Roderick Hoffman at news@barunner.org.uk. A big down-under thank you to the many contributors this issue! Winter Handicap Round 1 "A" and "B"
A lovely calm mild evening with a clear sky and a crescent moon greeted the runners lining up for the Green Man Five. Parking near the Green Man was as easy as expected and there would have been room for plenty more cars. Tony Barnwell also ran, but having been caught in thick traffic just trying to reach the start, he took a wrong turn early on and although some roads seemed familiar after the recce runs of the last two weeks he ended up running about six mile miles in 1:03:28. On this occasion, over an unfamiliar course, watches were allowed. One GPS watch calibrated in miles and 100ths recorded 4.99 miles. There will be a second opportunity for runners to get in a qualifying five mile run at Cranford next week (1st November). Please assemble at Cranford Community College by 6 p.m. Changing rooms and showers will be available. Run past Crane Lodge Road junction to finish. The course will be measured and should be close to exactly five miles in length. Note that we cross the Motorway Bridge at the beginning and at the end so ending all arguments about which is best! Round 2 of the winter handicap will be on Wednesday 29th November and the district and course will be announced when we know if and where shower will be available. In just under 2 weeks it will be time for a gallop around Epsom Downs in pursuit of Surrey League points for BAAC. We would welcome new runners, this fixture and the Roundshaw Downs one in December are not particularly muddy so are good for newcomers. It takes place on November the 11th at 3pm. If parkrun is your ‘thing’ then you can volunteer or run slow at parkrun in the morning and have plenty of time to get there. If you need a lift there or back, let me know and I will try and arrange one. New runners please let me know if you intend running so that I can register you as part of the team. It doesn’t matter if you don’t show but it saves me a headache if I can register you (for the season) in advance. Start and Finish is Epsom Downs @ Tattenham Corner (nearest postcode KT18 5PP). Epsom Downs is just a few minutes from Epsom Town Centre on the B290 Epsom Downs Road or alternatively just off junction 9 of the M25. Tattenham Corner is about half a mile past the entrance to the Grandstand with the racecourse on your right. There is public parking at Tattenham Corner but we recommend sharing as this is a popular car park for visitors to the downs. Epsom Station is connected by both South West Trains and Southern Trains. Metrobus operates a 460, 480 and 406F service which runs from Epsom Town Centre to Tattenham Corner Station. Tattenham Corner Station: Approximately 1/3 mile walk to the start. Epsom Downs Station: Approximately 1 mile walk to the racecourse. The course is 5 miles over 2 laps. The terrain is mainly grass and gravel but can also have soft sand and stones, it is suitable for spikes but long spikes are not advised. The course is generally quite fast but has large sections of steady incline and a few sharp turns. Please watch out for other downs users, especially on the intersections where cyclists and horse riders frequently use these paths. Please also watch out for tree roots and any other hazards. 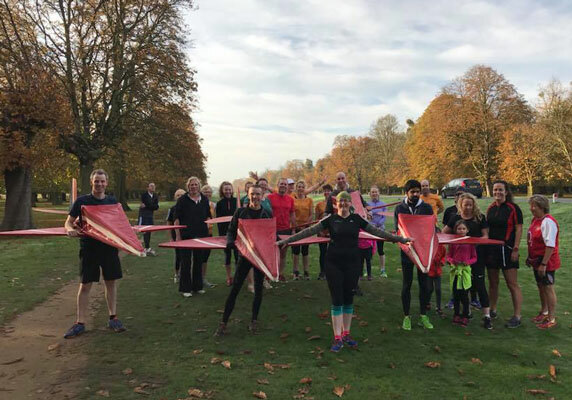 Please see https://surreyleague.org/sll/match/73/ for the details and www.barunner.org.uk/attachments/Map nonsuch course 2017.pdf for the course map for the Surrey Ladies XC League to be held at Nonsuch Park on 11th November 2017. Please note that Div 1 and Div 2 senior races will be run together at 11am. I will be there so look out for the blue picnic table. New runners - let me know in advance if you are going so that I can look out for you. If you have already let me know that you are not available, thank you. We hope to see you at the January match. Our annual invitation to the Royal Military Academy saw seven runners from BAAC lining up on the start line alongside runners from Milos AC, Thames Hare & Hounds, Sandhurst Runners & Runnymede and approx. 150 cadets from various regiments. The run starts on the playing fields in front of the Academy and wends its way out into the forest, before opening up on a sandy escarpment, which includes the notorious saddleback ridge and the pylon run. Times were quicker this year on the 5.3 mile course, mainly I think due to the mild weather conditions and lack of mud but it didn’t feel any easier! BAAC were a respectable 8th of 11 teams. It was good to see Richard (retiree) Ruffell leading us home and Barry fully recovered from his Wimbledon Common XC a couple of weeks ago. Mark was suffering from an Achilles injury that unfortunately flared up during the race, which meant Dennis snuck in as 6th scorer for the team. The customary post-race tea of sandwiches and cakes (or cakes and a sandwich in Barry’s case!) was well received. There was news this week that some progress has been made towards the introduction of a parkrun at Denbies Vinyard near Dorking where Mole Valley District Council has approved an application to create an extra carpark with capacity for 200 cars. This has been regarded as an essential prerequisite. The parkrun is likely to start in the first half of 2018 and is expected to be popular. There are no details about the course at the moment but it is unlikely to be flat! Maybe we can look forward to a club run there at blossom time. Back to reality and something notable has occurred in Northeast London. Dave Dixon has for a long while been one of our more talented runners but until last Saturday his nine parkruns had been spread over seven years. Nothing much of a discernible pattern has emerged other than twice running over an August Bank Holiday weekend. Suddenly he has run on two successive Saturdays with his latest effort at Hackney Marshes (17:24, 86.88%) if not a pb timewise certainly producing his best age-grade% and the best by a current member this year. Facebook fans will be all too aware of Petra Otto’s pb at March. Keep on improving Petra. With the Gunpowder Plot on every parkrunner’s mind (not) it may just be worth checking you’re your favourite run is operating as usual next Saturday. The parkruns at Guildford, Woking and Upton Court are known to have been cancelled and there are many others - see http://www.parkrun.org.uk/cancellations/. At Gunnersbury, where the long uphill slope inside the park and parallel to Lionel Road (North) has been a feature for the last six years, changes are afoot. The next phase of the park’s redevelopment is about to start and the parkrun course will be radically different for at least the next 12 months. With the climb up the that hill no more Alan Anderson, now only 20 short of his “500”, will be given a new lease of life! Whether times will be any different remains to be seen. Like the old course, the new two lap course will start and finish at the same altitude. I was a bit slower than usual at Bushy this week, but I did have an excuse! I was one of the Red Arrows celebrating Kirsty Bangham’s 500th and did the entire run in costume! I ran at Curl Curl for the opportunity to meet up with former club member and colleague Caroline Yarnell. She was very well and her running is getting better as she ages - which she demonstrated by finishing in 23:01, though I think she was disappointed with that time. Although she has been based in Sydney for over fifteen years she still retains some of her Britishness - including that she finds a 7am parkrun on a Saturday morning far too early! Whilst at Curl Curl I was introduced to another Caroline - Caroline Carter - who had just received the credit of being the most Passionista parkrunner in New South Wales since she has run at Curl Curl 167 times without once running anywhere else. Somewhat of an opposite to me with my 209 different venues. Snowdonia trail half marathon in sunshine this year. I am sure that some members of BAAC have run there but if not then it is a treat especially if the weather is bright and sunny as it was on Saturday. It is a challenge with the first 1 or 2 kilometres being up a steep hill, then a couple of kilometres running downhill towards the sea and a lighthouse followed by running a long steady uphill near the cliff tops for a few kilometres and then a fun but steep couple of kilometres downhill to the finish. Facilities were excellent with a bag store, good food and drink stalls, showers, and massages available. 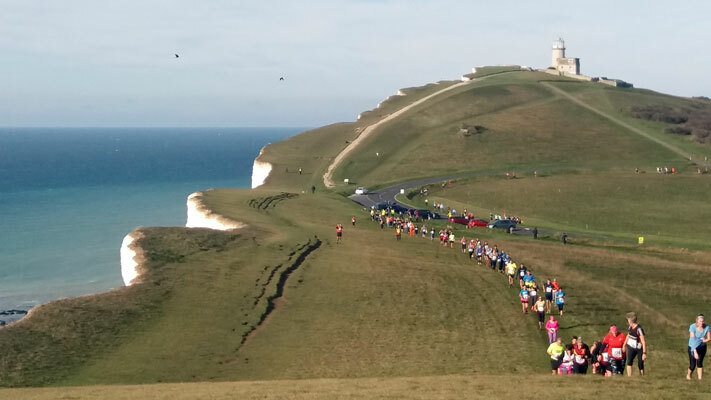 Afterwards I spent a couple of hours at Birling Gap NT spectating at the marathon 4 miles from the finish and was so inspired that I have already entered next year’s marathon. Oh and my time in the 10k, it was something like 1:06 (with a few minutes of that taking pictures and waiting for others) but time didn’t matter on this occasion, I was there to enjoy it and that aim was achieved.